Plastid Genome Evolution, Volume 85 provides a summary of recent research on plastid genome variation and evolution across photosynthetic organisms. It covers topics ranging from the causes and consequences of genomic changes, to the phylogenetic utility of plastomes for resolving relationships across the photosynthetic tree of life. 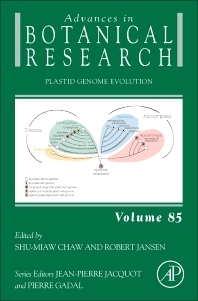 This newly released volume presents thorough, up-to-date information on coevolution between the plastid and nuclear genomes, with chapters on plastid autonomy vs. nuclear control over plastid function, establishment and genetic integration of plastids, plastid genomes in alveolate protists, plastid genomes of glaucophytes, the evolution of the plastid genome in chlorophyte and streptophyte green algae, and more. Dr. Shu-Miaw Chaw is a Distinguished Research Fellow and Director in the Biodiversity Research Center (BRC), Academia Sinica, Taiwan. She is also an adjunct Professor in Department of Life Science at National Taiwan Normal University. Dr. Chaw received her Ph.D. in Biology in 1985 at Tulane University, New Orleans. She did postdoctoral research at Institute of Plant and Microbial Biology (IPMB), Academia Sinica, was an Associate Research Fellow of IPMB in 1987-1993, and a Research Fellow in 1993-2005. She shifted to BRC in 2005 as a Research fellow and later a Distinguished Research Fellow in 2010 and served as the Director since the mid December of 2016. Dr. Chaw’s primary research focus is on phylogenetic relationships of the extant seed plants and within the gymnosperm orders using comparative plastid genomics. Dr. Chaw serves on the editorial board of several journals, including Botanical Studies, Genome Biology and Evolution, International Journal of Plant Research, and Species Biology. Dr. Robert K. Jansen is the S.F. Blake Centennial Professor in the Department of Integrative Biology at The University of Texas at Austin. He is also a member of the Institute of Cellular and Molecular Biology (ICMB) and the Center for Computational Biology and Bioinformatics and UT-Austin. Professor Jansen received his Ph.D. in Botany in 1982 at Ohio State University. He did postdoctoral research at the University of Michigan and was an Assistant Professor at the University of Connecticut from 1987 - 1991. He joined the faculty of UT-Austin in 1991 as an Associate Professor. Professor Jansen served as Chair of the Department of Integrative Biology from 1998-2015. Professor Jansen studies plant molecular systematics and evolution with a primary focus on comparative genomics of plastids, and their utility for understanding genome evolution and phylogenetic relationships of angiosperms. Dr. Jansen serves on the editorial board of several journals, including BMC Evolutionary Biology, Journal of Plant Biology, Plant Systematics and Evolution. He is also a member of the Scientific Advisory Board of Seacology, the Advisory Committee of Biodiversity Research Center, Academia Sinica, Taiwan, and a Distinguished Adjunct Professor at King Abdulaziz University in Jeddah, Saudi Arabia.